Another two games from the SEGA Genesis (Mega Drive) classic games made it to the OnLive PlayPack. The games are Galaxy Force II and Kid Chameleon. This brings the PlayPack to 169 games and counting. Galaxy Force II is a sprite-scaling rail shooter arcade game classic published and developed by SEGA. Halcyon, ruler of the Fourth Empire, had Junos marked as its final target in the galactic massacre, and had sent the bulk of his attacking force in with a single purpose - the elimination of all life forms in the system, and the construction of a gigantic fortress on each of the five planets from which to rule the galaxy. The galaxy's recognized governing body, the Space Federation, began recruiting attack pilots in an effort to reclaim Junos. Strap yourself into your TRX-5 Quasar and turn the tables on Halcyon. You can play the free demo of Galaxy Force II for the US powered by OnLive. You can play the free demo of Galaxy Force II for the UK powered by OnLive. Kid Chameleon is an adventure platform game classic published by SEGA and developed by the SEGA Technical Institute. Heady Metal, the boss of the arcade game Wild Side, has escaped! He's capturing kids by defeating them at their own game. Take the boy named Marty McFly, oops I mean Casey, who calls himself "Kid Chameleon" into Wild Side and give Heady metal and his gruesome underlings a taste of their own aspirin. Because Kid Chameleon is about to cause a few headaches of his own! 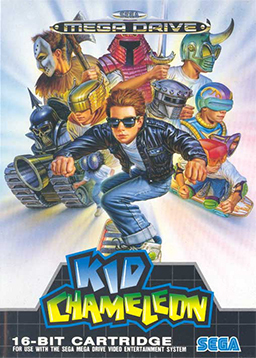 You can play the free demo of Kid Chameleon for the US powered by OnLive. You can play the free demo of Kid Chameleon for the UK powered by OnLive.